one // I have been a fan of Inslee for years and one of my favorite items that she creates are her yearly calendars. This year’s classic calendar is all kinds of cute, but she also offers an animal calendar, a food calendar and a botanical calendar, all equally as stunning. two // Pamela Munson began creating beautiful straw handbags this year and they quickly became a must-have in my wardrobe. For the more elegant beach goer on your list, Pamela’s hats are both classic and unique. three // I cherish all my jewels, and I love being gifted feminine storage trays and boxes. When you live in NYC, every square inch of space counts, and these colorful boxes keep my nooks looking fabulous. These cute boxes come in just about every shade in the rainbow. four // Quirky Etsy finds are always awesome gifts. My Etsy purchases are often the items that friends will remark, ”where on earth did you get this”? All of the meme needlepoints are hilarious, but kermit has to be my favorite. five // Rebecca Atwood has an incredible eye for textiles, mixing prints, and color. Last year I was gifted her book ‘Living With Pattern’ and it has remained on my coffee table ever since. Take a look through her site, as there are so many great gifts, from the book to pillows to table linens. six // The twin duo behind Lizzie Fortunado are as kind as they are creative. The sisters use a mix of unexpected color, materials, and metals to bring to life incredible pieces that are surprisingly versatile. These earrings are my favorite of this season, but also be sure check out their selection of necklaces. If you are in NYC this holiday season, check out their pop up shop, open through the month of January at 110 E 7th Street. seven // I love the beach and I love color, so I was thrilled when I got my hands on an original Teil Duncan piece! Teil’s color combinations are so inspiring and she always seems to choose subjects that I adore (her flowing dresses collection made my heart skip a beat). For the color loving art fan in your life check out her prints. eight // Originally launching with vintage jewels, but now expanding into additional categories, Sweet and Spark has a knack for finding those feminine, vintage pieces that fit seamlessly into the more modern wardrobe. For the girl who has everything, vintage is the perfect gift idea, and with most of their pieces under $100, you won’t break the bank. nine // 31 bits partners with women around the world to bring their crafts to life. They produce beautiful, mostly hand made goods that help support women, their families, and their communities. They have a huge range of cool products to choose from, but the drum bag is my personal favorite! ten // Back in 2012, I met Frank Clegg in his shop in New England where he was hand making quality, leather bags that would last a lifetime. Frank has been in the business since 1970 and his passion for his craft is contagious. The gorgeous all leather duffle has been around the world and back with me and it is one of my favorite belongings. eleven // Everyone loves a little greenery in their lives. The Sill, based in NYC, offers the most adorable little potted pick-me-ups. These tiny succulents make amazing gifts. twelve // I stumbled upon the Toino Abel shop on Etsy and fell in love. Their bags are the perfect surprise for the basket-bag-loving lady in your life (we all have one). The unique shapes make them feel more like a coveted handbag than a run-of-the-mill tote, and the color combinations and stripe details take it all up a level. Check them all out here. 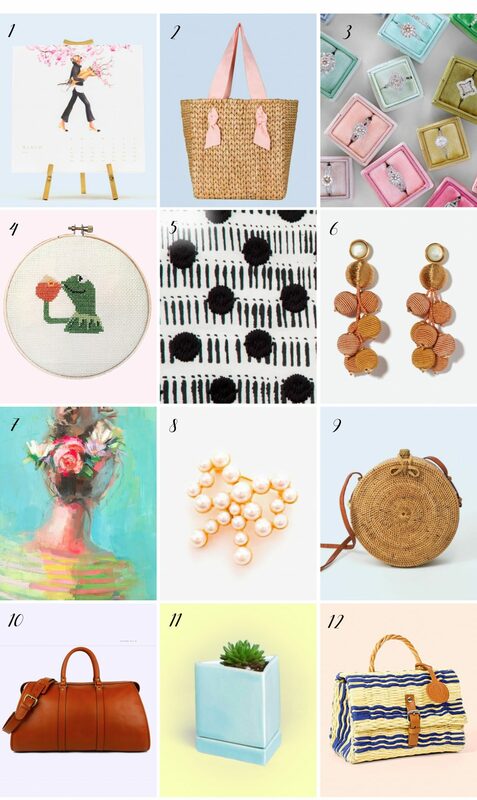 Thank you so much for including my line in your gift guide!